A mucous cyst is a ﬂuid-ﬁlled sac that occurs on the ﬁnger joint closest to the nail. 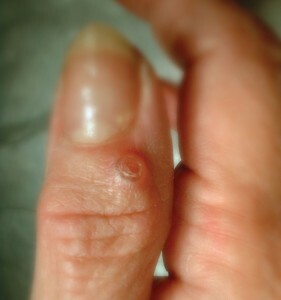 The cyst may thin the skin and may cause a groove to form in the nail. Most patients who develop a mucous cyst have wear and tear arthritis (osteoarthritis) of the involved joint. The cyst has a stalk that is connected to the joint. It is thought that underlying bone spurs from the arthritis weakens the joint lining allowing the cyst to form. The mucous cyst typically has a characteristic appearance, and the diagnosis is straight-forward for most hand specialists. Radiographs are usually ordered to conﬁrm underlying arthritis of the joint and associated bone spurs. Most mucous cysts are not painful. If they are not causing pain or dysfunction, they do not require treatment. In these cases, observation for changes in the cyst is all that is needed. If a patient develops pain, recurrent drainage, or nail deformity, treatment may be indicated. Even if not painful, diagnosis should be conﬁrmed by a physician, as other diseases may mimic a mucous cyst or ganglion cyst. Drawing the ﬂuid off the cyst (aspiration) is not recommended since there is a high recurrence rate and the procedure could lead to an infection of the joint. Aspiration and other techniques that only remove the cyst are not effective because the joint spur is still present. To adequately remove the bone spur (osteophyte), surgical treatment is required. If I decided on surgical treatment, what is involved? The surgery takes approximately 15-20 minutes to perform, and the patient can go home the same day of the procedure (outpatient surgery). The procedure is usually performed with a local anesthetic only which is safer and less expensive than general anesthesia. This also allows patients to have their regular meals prior to the surgery. After the surgery there will be a bandage on the involved ﬁnger and the stitches are removed at about 10-14 days. Patient satisfaction for this surgery is very high. There is about a 5% chance the cyst will return with surgical treatment. Complications are uncommon but can include scar tenderness, infection, recurrence, and continued nail deformity. Image provided by American Society for Surgery of the Hand. The material provided on this site is intended for general information only and does not constitute medical advice. The information does not replace direct evaluation by a physician.